If you are looking for an extra level of luxury for your holiday in Cornwall then renting a place to stay with a hot tub might just be the perfect way. Along with an open fire what could be a better addition to any romantic get-away? Here at the Cornwall Guide we have a range of accommodation with both private hot tubs and shared, all to make your holiday that bit more relaxing. 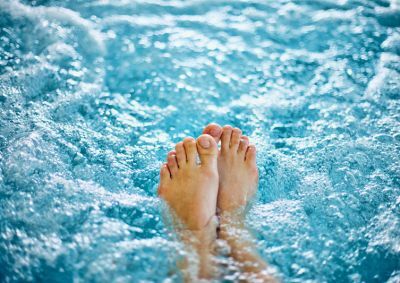 Hot tubs are the ideal way to unwind after a day out, whatever the time of year; just imagine returning from a bracing winter's walk out on the cliffs to a enjoy a soak with a cup of hot chocolate. Or you could enjoy the sunset after a day at the beach with a glass, or two of your favourite wine. Yes, we have cottages with hot tubs and a sea view!